In a small network(in my company), I would like to block some computers(PCs) to access the internet, so that sensitive data or files in those PCs can not be leaked. But I still need users of the PCs to access the internet through remote desktop. 1, the PCs have some sensitive data and files, so access to internet is blocks by the Router. (the Router has a simple firewall which can block the connection to internet through a mac address black list) But the PCs can access to LAN. 2, I have a server computer which is running Centos, and I have created a VNC server and a FTP server on the server. 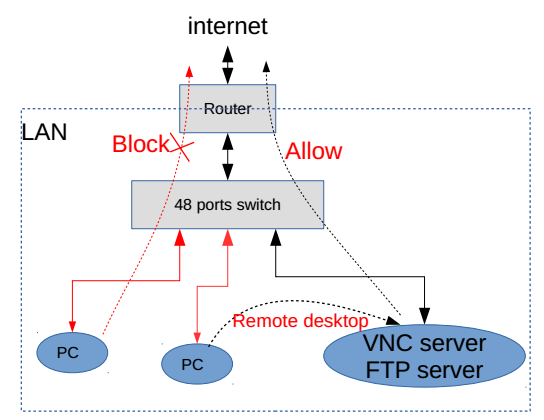 3, to access the internet, the users can SSH from PC to the VNC server, and open the browser in the VNC remote desktop(the server is allowed to access the internet), if the the user would like to download some files, he can first download the file in the server, and put the file in the FTP server. 4, from user's PC, he can download the files through FTP from the server. Note1: the VNC remote desktop is not allowed to transfer files, so that files can't be transferred from PC to the servers. The FTP server is read-only, which means files can only be transferred from server to PC. My question is: Is this way secure? All what I want to achieve is that I want the data/files in PCs never get leaked, but I still allow users of PC to access the internet through remote VNC desktop. And data are only allowed go this way: from internet to server, then from server to PC. Any other ways to achieve this? Browse other questions tagged security firewall local-area-network network-design or ask your own question. Can a remote server access my local resources when using remote desktop?